Does the Amount of Sunlight That a Tomato Plant Receives Affect the Size of the Tomatoes? A tomato plant (Lycopersicon esculentum) requires lots of sunshine in order to bear an abundant, full-size crop. Gardening experts recommend a minimum of six to eight hours of full-sun exposure daily for tomato. If the plant receives less than that amount of sunlight, its fruits will be smaller than they would be with more sunlight, according to a 1994 study sponsored by the University of Florida. The amount of difference in the study, however, fluctuated greatly by tomato plant variety. In the University of Florida study, scientists weighed the fruits of three container-grown tomato varieties, "Micro Tom," "Patio" and "Pixie Hybrid II," produced while in full sun, 30 percent shade and 50 percent shade. "Micro Tom," a cherry tomato plant, showed the most significant variance in the three levels of light. Although "Patio" and "Pixie Hybrid II," both standard-size tomato plants, bore larger fruits as the light level increased, the contrast was less than what "Micro Tom" experienced. "Patio," the least affected of the three varieties, demonstrated only a 23g, or 0.0507 pound, difference between the weight of tomatoes grown in 50 percent shade and those produced under full sun. 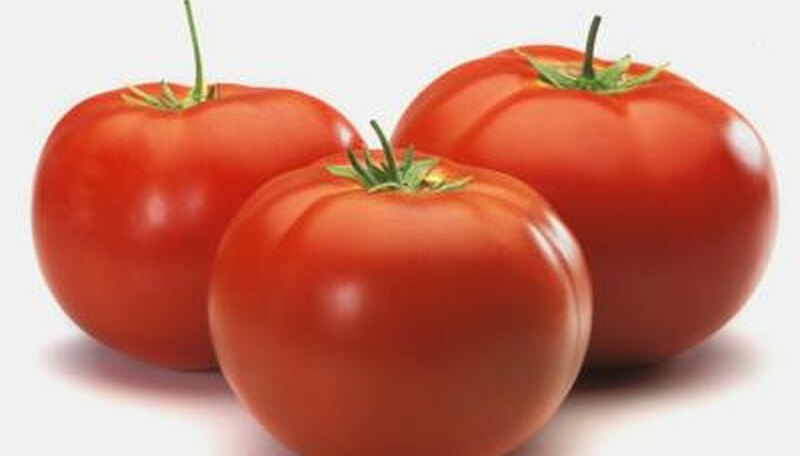 Researchers concluded that for best tomato production, "Micro Tom," as well as the other subjects, should be grown in no more than 30 percent shade. The same study also tested how fertilizer rates affect the number and size of tomatoes produced under different lighting situations. Increasing the fertilizer rate influenced the larger-sized cultivars more than increasing the light did, but "Micro Tom" showed the opposite effect. Consider the temperatures and length of the summer growing season where you live, and choose tomato varieties compatible with your climate for an optimal crop. When tomato plants have been sprayed with hormonal fruit set products that substitute for pollination, the resulting fruit is puffier than normal. Home gardeners may be most enamored of hefty tomatoes that when sliced can cover a bun or slice of sandwich bread. Contests to see who can grow the largest specimen are popular. Large-fruited tomatoes, from varieties such as "Better Boy," "Beefsteak" and "Big Beef," can easily top 1 pound in weight. "Burpee's Supersteak Hybrid" can produce 2-pound fruits, and the "Delicious" variety has borne a tomato weighing close to 8 pounds. Tomato fruits grow to their expected full size and beyond, though, only where both days and nights are warm. Although getting enough sunlight is important for maximizing the yield and size of tomato fruits, too much sunlight can damage them. Sunscald, a physiological disorder caused by unrelenting sunlight, results in sunken, light-colored spots on developing tomato fruits. Prevent the problem by growing varieties such as "Better Boy" with plenty of foliage to protect the tender fruits. Using cages to support your tomato plants may keep their fruits healthier than if the plants are staked and exposed to excessive sunlight.